video in FSM’s email newsletters. Don’t miss it. Sign up today! What’s Missing on Your Work Bench? SHAPE SHIFTERS NEW Aluminum Wire Center Holds any Shape! We deliver results! Order yours today! www.flex-i-file.com www.alphaabrasives.com YOU CLICK - WE SHIP - WORLDWIDE! ARA Press The Spaceship Enthusiastsâ&#x20AC;&#x2122; One-Stop Data Shop! 6RYLHW6PDVKXS Our two titles dealing with Soviet space programs available in this special combination offer. Peter Alway's Twelve Soviet Missiles, a survey of Soviet military missiles from the 1950â&#x20AC;&#x2122;s and â&#x20AC;&#x2122;60s, makes the perfect companion for our critically acclaimed N-1: For the Moon and Mars which tells complete story of the N-1 Superbooster. Get both of them together at a significant savings! DQVDYLQJV  Weâ&#x20AC;&#x2122;ll even pay domestic shipping! CONTENTS May 2015 • Vol. 33 • No. 5 Online Content Code: FSM1505 Enter this code at www.FineScale.com/code to gain access to web-exclusive content. On the Cover Instead of visiting the aftermarket, John C. Backenstross improved his 1/32 scale P-51D Mustang with clever scratchbuilt parts. Get more at www.FineScale.com! Visit our website! You can enjoy more modeling photos and feature articles, access additional modeling resources, get industry news, see previews of upcoming issues, or register to participate in our forum. And it’s free! Subscribers: Click on “Register,” enter the customer number from your subscription label, and throughout your subscription you’ll have unlimited access to bonus features, more than 1,400 kit reviews, and a database of more than 14,000 products! FineScale Modeler (ISSN 0277-979X, USPS No. 679-590) is published monthly (except for June & August) by Kalmbach Publishing Co., 21027 Crossroads Circle, P.O. Box 1612, Waukesha, WI 53187. Periodicals Postage is paid at Waukesha, WI and additional offices. Postmaster: Send address changes to FineScale Modeler, 21027 Crossroads Circle, P.O. Box 1612, Waukesha, WI 53187-1612. Canada Post Publication Mail Agreement #40010760. 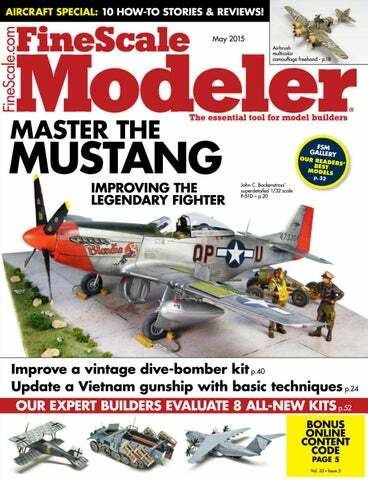 New technology and old friends WELCOME TO the May issue of FineScale Modeler! Here at FineScale Modeler HQ we’re headed toward summer. While yardwork and other outdoor duties are ahead, I’ll always make time for a little modeling, and I hope you will, too, no matter what season you’re headed into. Drone. It’s a simple five-letter word, but it’s a subject that’s entered the public consciousness like few others in recent memory. They’re a fascinating subject, and if you’re interested in learning more, I have a great special-edition publication to recommend. Produced by our sister publication, Discover, and edited by our own Tim Kidwell, Drone 360 is full of top-notch, meticulously researched information on these rapidly evolving flying machines. Kalmbach Publishing after a 27-year career. I couldn’t begin to tell you how many projects Patti brought her talents to during her time here, but for the many years I had the opportunity to work with her, she was always upbeat, enthusiastic, and seemingly never without a smile on her face. Although I will miss her talent and her presence in the office, I wish her nothing but the best in her retirement, a sentiment shared by all of us on the FSM staff. Thanks for everything, Patti! Vice President, Editorial, Publisher Kevin P. Keefe Senior V.P., Sales & Marketing Daniel R. Lance Vice President, Consumer Marketing Nicole McGuire Advertising Director Scott Bong Corporate Art Director Maureen M. Schimmel Art and Production Manager Michael Soliday Circulation Manager Cathy Daniels Single Copy Specialist Kim Redmond ADVISORY BOARD John Noack, Paul Boyer, Shep Paine, Bob Collignon, Cookie Sewell, Pat Covert, Rusty White, Pat Hawkey ÂŠ2015, Kalmbach Publishing Co. All rights reserved. Title is registered as trademark. This publication may not be reproduced in part or in whole without written permission from the publisher, except in the case of brief quotations used in reviews. Postmaster: Periodicals postage paid at Waukesha, Wisconsin, and additional offices. Send address changes to FineScale Modeler, Kalmbach Publishing Co., 21027 Crossroads Circle, P.O. Box 1612, Waukesha, WI 53187-1612. SUBSCRIPTION RATES: single copy $5.99; U.S.: 1 year (10 issues), $39.95; 2 years (20 issues), $74.95; 3 years (30 issues), $106.95. Canada: Add $8 postage per year. All other international subscriptions: Add $12 postage per year. Payable in U.S. funds, drawn on a U.S. bank. Canadian price includes GST (Canada Publication Mail Agreement #40010760, BN 12271 3209 RT). Expedited Delivery Service: Domestic First Class, add $20/yr. ; Canadian air, add $20/yr. ; International air, add $45/yr. Letters, new releases, and new-product information are accepted as gratis contributions to FineScale Modeler. Feature articles and scale drawings are paid for on acceptance. All other submissions are paid for upon publication, at which time FineScale Modeler obtains all reproduction rights unless otherwise agreed. Instructions for submitting features, photographs, and drawings for publication are available from the editorial associate or online at www.FineScale.com/contribute. Unsolicited material will be returned only if postage and envelope are provided. FineScale Modeler is not responsible for the safe return of unsolicited material. Printed in U.S.A.
Lowell made his diorama of a German fighter escorting a wounded B-17 home the centerpiece of his model display at the Vigo County Public Library last December. From $499 - More details on www.parrot.com Parrot SA - RCS PARIS 394 149 496. SCALE TALK “paper” panzers. Come on, give us French armor. Some of the 1930s camo schemes are amazing. I’ve seen one with a blue band on top of the turret to mimic the sky. An investment in a mold of the Lorraine 37L APC chassis could be the basis for German self-propelled guns and antitank vehicles. The fact that Heller’s is the only kit of the SOMUA S35, just amazes me. The French halftracks of the early ’30s are really cool, to say nothing of the Char D2 infantry tank. Keep up the good work. I thoroughly enjoy the magazine. First, it is extremely hard to paint wheels if the rims aren’t raised and distinct to create a “no-go” line for paint. Molding the wheels with more distinct rims would definitely help. Second, the same idea applies to canopies. Without distinct lines, it is nearly impossible for almost all of us to mask a canopy successfully. Alternatively (or in addition), I would love to see kit makers include masks for canopies and wheels. They don’t even have to be actual masks, just printed on paper so they can be traced into masking tape to make the real masks. Use a separate piece, please, so those who like to save the instructions for the kits they build don’t have to either cut them up or copy them, which can introduce slight errors in size. – Dave Thewlis McKinleyville, Calif.
Mark Korda’s letter in the March 2015 FineScale Modeler (“Why not two sets of decals?” Page 8) inspired me to offer a couple of suggestions for kit makers that would definitely help modelers, especially less experienced or talented ones such as me. think. The 109F only had a single small triangular window below the port side of the windscreen, unlike the E, which had this window on both sides. My first plastic model, which I actually painted with an airbrush, had specialty decals, scratchbuilt cockpit details, vacuumformed canopy, and was a conversion of the 1/72 scale Hawk Bf 109G kit. I made the same mistake and didn’t flash on it for years! I still have the model, and it has a place of honor on my model shelf. – Weldon Dunlap Mililani, Hawaii Let us know what you think! Comments, suggestions, corrections, and additional views on FSM articles are welcome. E-mail your thoughts to editor@FineScale.com, or visit FineScale.com and click on “Contribute to FSM.” You can also mail typed or handwritten letters to the address on Page 6. Clearly mark “To the Editor” on the envelope. Please limit your comments to no more than 300 words and include your name and location. Now at FineScale.com Download a desktop wallpaper Download a desktop wallpaper of the Kitty Hawk 1/48 scale F9F-8/-8P Cougar built by Paul Boyer for review in the May 2015 FineScale Modeler. FineScale.com/Reviews Workbench Reviews Subscribers receive early access to upcoming reviews. Weekly free review Check out this week’s free model kit review. FineScale.com/HowTo Article archive Search our article collection to ﬁnd the answer to your modeling question. Tips database Subscribers can search our extensive database of reader-supplied tips. FineScale.com/OnlineExtras Model-ﬁnishing terms and deﬁnitions FSM regular Cookie Sewell clears up the confusion surrounding some of the more recent terms to come out of scale modeling, including color modulation, ﬁlters, and glazes, and goes over some well-known techniques, too. Video issue previews FSM Editor Matthew Usher highlights what’s inside the current and past issues. New Product Rundown Associate editors Tim Kidwell and Aaron Skinner pick the hottest scalemodel subjects, open up the boxes, and tell you why they rock. tHighlights from FineScale Modeler Find out what's in the current issue and preview forthcoming issues. tOnline Extras Learn about stories and photos exclusive to our website. tHot Forum Topics Discover what people are talking about on the FineScale Forum. tSpecial Offers Register for sweepstakes and take advantage of special offers on subscriptions to FineScale Modeler. www.FineScale.com/newsletter Rest assured, your e-mail address is safe with us. We won’t sell it, give it away, or otherwise violate your privacy. Buy now from your local hobby shops! ture on some of the parts. Troop seats can be posed lowered or stowed. Details abound in the cab: full controls (including pedals), an adjustable driver’s seat, decal instruments for the dash, and even a clear dome light. Optional parts allow the windshield panes to be posed open. Photoetched brass is used for mudflaps, bumpers, tie-downs, light brackets, steps, and jerry-can racks. Decals and painting diagrams provide markings for four vehicles: two Finnish KrAZ-255Bs, and one each in East German and Soviet service. HobbyBoss’ KrAZ-255B costs $87.99. Hobby (www.hataka-hobby.com) from Poland aims to aid that quest with its new USAF paint set (HTK-AS09). The set includes six 17ml (a little more than ½ oz.) eyedropper bottles. The colors included are dark tan, dark green, medium green, and camouflage gray for the standard SEA camouflage, night black for the underside of Strategic Air Command aircraft, and the air defense gray used for most USAF fighters. These are water-based, airbrush-ready paints. Each bottle has an agitator to mix the paint. Hataka also has sets for Royal Air Force and Luftwaffe aircraft in North Africa, the Battle of Britain, and late World War II. Other sets include Polish air force colors and American air force and navy late-war camouflage. The USAF Vietnam War Era set costs $24.99. Look for a detailed review in an upcoming issue of FSM. products can be purchased from several online merchants shown on the company’s website. The Hürkuş-A is expected to cost $15. Phantom P-51D Mustang from Monogram, No. 85-0067, $49.95. Transparent see-through working model. Mirage IIIE from Kinetic, No. K48050, $63. Kinetic. Look for a detailed review in an upcoming issue of FSM. from Xtradecal, No. X32057, $13.50. Marking for four F4U-1A Corsair Mk. IIs: one in New Zealand service, three from the Royal Navy. Sea Harrier FA2 from Kinetic, No. K48041, $60. Kinetic. Look for a detailed review in an upcoming issue of FSM. 1/72 SCALE KITS Folland Gnat T.1 from Airfix, No. A05123, $24.99. Look for a detailed review in an upcoming issue of FSM. detailed review in an upcoming issue of FSM. F-35C Lightning II from Orange Model, No. A72001, $24. Look for a detailed review in an upcoming issue of FSM. Ju 87 G2 Stuka from Victrix Ltd., No. VAC001, $37.50. Three models per box with telescopic pivoting flight stands. Undercarriage has options for both winter and summer conditions. 4 sets of decals included. M50 Ontos from Renwal Blueprint Models, No. 85-7823, $23.95. Includes combat crew of 3. $24.99. Look for a detailed review in an upcoming issue of FSM. Vantour landing gear (for Special Hobby/ Azur) from Scale Aircraft Conversions, No. No. VAC002, $37.50. Three models per box with telescopic pivoting flight stands. Option for undercarriage to be built raised or lowered, 3 sets of decals including 2 for Normandy 1944. Xtradecal, No. X72217, $12. Markings for 10 RAF day and night fighters. Designed for the new Airfix kit. Xtradecal, No. X72214, $13.50. Markings for 15 Hunters: two Indian, three Rhodesian, two Singaporean, and one each from Saudi Arabia, Abu Dhabi, Chile, Kenya, Qatar, Oman, and Zimbabwe. AR MOR 1/16 SCALE KITS ZiL-131 Soviet truck with Soviet motorized rifles figures from ICM, No. 35516, $54.99. Somua S35 from Tamiya, No. 35344, $68. 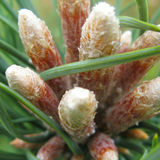 www.FineScale.com featuring reviews, product information, photo galleries, and more! A description of our new-product announcement and review policies is available from Product News Coordinator, FSM, 21027 Crossroads Circle, P.O. Box 1612, Waukesha, WI 53187, 262796-8776, fax 262-796-1383, or e-mail at newproducts@finescale.com. FineScale Modeler is not responsible for content of external sites linked through our site. Visit our website at www.FineScale.com. Merit International, No. 64802, $93. from ICM, No. 35637, $15.99. Merit International, No. 67203, $125. No. 6812, $8. USS Yorktown CV-5 from Merit International, No. 65301, $179.98. Look for a detailed review in an upcoming issue of FSM. Christopher Columbusâ&#x20AC;&#x2122; flagship Santa Maria from Zvezda, No. 6510, $10.75. $25.99. Build it three ways (stock, custom or drag). www.FineScale.com Subscribers have exclusive access to model kit photos not published in the magazine! Simply go to FineScale.com/Reviews. $22.95, by Rick Morgan, soft cover, 96 pages, mostly color photos and color renderings, few black-and-white photos, ISBN: 978-14728-0565-5. From Osprey Publishing. Steve Ginter, soft cover, 272 pages, 740 blackand-white photos, ISBN: 978-0-9892583-6-4. From Ginter Books. Aero Research Co., No. 1059, $12.95. 156 images of 26 different types of US Navy aircraft from the 1950s to the 1990s. Wash: Made mostly of fabric and wood, the S.M.79’s skin doesn’t show many panel lines. Shane used washes from The Detailer to emphasize them and other recesses. Markings: Tauro decals marked the bomber for the 27th Gruppo, 8th Stormo, one of the first S.M.79 units sent to Africa in 1941. Shane layered three decals on the wing insignia to hide the dark camouflage colors beneath the white. Camouflage: The tan and green areas defined where the brown streaks needed to be. Holding his Badger Velocity close to the surface, Shane sprayed at an angle away from the outside edge of the color area to get the sharpest possible line. an S.M.79 Primer: A couple of coats of spray-can Mr. Surfacer 500, separated by light sanding, eliminated seams on the fuselage. Brushed-on Mr. Surfacer took care of small gaps elsewhere. Antennas and rigging: As the build drew to a close, Shane strung EZ Line to replicate radio aerials and guy wires. Designed for model railroads, the elastic thread stretches taut but has flexibility to withstand bumps. Rather than visit the aftermarket, John made a few improvements to Tamiya’s P-51 with clever scratchbuilding. 1 Tamiya provides a great replica of the Packard Merlin engine, comprising more than 45 parts. I built it in subassemblies. 2 Referring to photos, I added styrene detail, including .040"rod spark-plug connectors and .060" rod for the PVC outlet. I installed wrapped .024" guitar string in holes drilled for the braided cable on the intake and spark-plug wires. To replicate piping between the coolant pump and tank, I strung .035" aluminum wire with .090" styrene-tube couplers; 26-gauge wire plumbed the supercharger. I painted the engine Tamiya semigloss black and weathered it with brown pastels. Tamiya’s 1/32 scale aircraft pack a punch, especially in the detail department. They contain hundreds of parts, including photoetched metal, vinyl tires, metal landing-gear supports, and canopy masks. After several days spent studying the instructions and parts for the P-51D Mustang (kit No. 60322), I was determined to build it straight from the box — mostly. I added detail here and there, scratchbuilding rather than sourcing aftermarket sets. 5 The side walls were pretty complete but benefited from a little extra work to match photos. On the left fuselage half (top), I added 34-gauge wire going aft and connected the throttle to the console with .015" wire. The right received double and triple strands of 34-gauge wire. 7 I deepened holes in the M2 machine-gun cooling jackets by boring out the molded depressions with a No. 76 (.020") bit. 6 BarracudaCals cockpit stencil and placard decals make the cockpit look appropriately busy. But they are tiny, so I wore my OptiVisor when applying them. 8 Thereâ&#x20AC;&#x2122;s a lot new in the main wheel wells, including: a sewing-pin actuator; hose straps and tie-downs from Model Car Garage; .015", 26-, and 34-gauge wire fed through holes drilled in the gussets; and Tamiya metallic blue (X-13) paint to represent connectors. 10 To fill small gaps like wing roots, I prefer automotive spot-glazing putty: Itâ&#x20AC;&#x2122;s creamy and goes on smooth. Tape protects detail around the gaps from damage during sanding. I hollowed out the plastic oleo scissors (parts J11) with a micro drill bit and file to conform to the photoetched-metal parts (A4) that wrap around them. After measuring the width of the oleos, I cut a piece of Bare-Metal Foil ultra-bright chrome just a little bit longer than necessary to go around the oleo. Before wrapping the foil around the leg, I tack one end in place with a tiny dab of super glue. This locks the foil in place while I burnish it with a round toothpick. In preparation for Alclad II metallic lacquers, I primed the Mustang with Rust-Oleum gloss black acrylic lacquer. After two days, I wet-sanded the paint with 1500-grit sandpaper. I airbrushed Alclad II airframe aluminum as a base coat, then masked and sprayed various panels Alclad II dark aluminum, polished aluminum, duraluminum, and white aluminum. After painting the 75-gallon drop tanks Alclad II white aluminum, I drilled holes topside and added 26-gauge-wire fuel lines with connectors made from electrical tape and hose clamps from Model Car Garage. www.FineScale.com Visit our website for a guide to Jim’s past articles and his book, Building and Detailing Realistic Sherman Tanks, available from Kalmbach Publishing. or someone who usually builds armor, the Academy/MRC 1/35 scale UH-1C Huey gunship (kit No. 12701) may seem like a strange choice. But I think of this famous Vietnam veteran as a flying armored personnel carrier packing some pretty potent ordnance. Unlike the pile of products you can add to most armor models, there is not a mountain of aftermarket goodies to augment Bell’s famous chopper. However, Eduard’s “Big Ed” set (No. BIG3209) provides interior and exterior details, enhancements for the armament, masks for the glass, and prepainted remove-before-flight tags. With that, I sallied forth to improve the kit. 1 Inside, poor fits left some ugly gaps. But .010" sheet styrene served well enough for shims at the top corners of the bulkhead and along the left side of the floor. Sanding helped fit other pieces. 3 Eduard provides photoetched metal inserts for the pilots’ seat side panels, but Jim left them off. He did cut slots in the kit parts for the photoetchedmetal belts, though — and each belt had six or more parts! “Next time, I’ll add the metal buckles to masking tape,” he says. 2 Jim painted instrument consoles, but filling and sanding to fit meant much of the interior would have to be painted after it was mounted in the fuselage. 4 Jim left the co-pilot’s seat empty, but he seated the pilot figure, gluing the stick and collective in its hands to ensure a good fit at those points. The figure comes in the kit; its head is from a CMK set. 5 The last major items before closing up the fuselage were the troop seat and ammo bins underneath it. Jim made sure the photoetched-metal seat belts were naturally mussed up. He slightly repositioned the kit figure’s head and supplied an M60 from a Dragon set. 7 Jim masked the instrument consoles, base-coated the interior flat black, then painted it dark gull gray. 8 After shaving molded details from the kit’s main instrument panel, Jim glued Eduard’s printed card to it and super glued the photoetched-metal plate over it. He dry-brushed with aluminum and detailed with other colors; a drop of 5-minute epoxy replicated glass on each instrument face. 10 Faced with poor-fitting glass with no molded frame on it, Jim fudged a little with the masking to “straighten” the edges. Doing so also covered bumpy blemishes left from thick sprue attachments. A bit of putty further smoothed the installation. Mounting the weapons was a fiddly business; nothing aligned easily. Little of the Eduard set applied to this version’s armament, and the Legend Productions resin parts presented their own set of challenges. Jim left off the ends of the rocket pods for easier painting. After a flat black base coat pre-shaded the exterior, Jim applied Testors Model Master olive drab (FS34087), post-shading with lightened shades. Dry-brushing with Model Master Afrika dunkelgrau picked out rivet heads and other raised details. Setting solution subdued the nose-art decal, but Jim couldn’t get the decals at the end of the boom to behave. Instead, he painted those markings and the stripes on the tail rotor. He oversprayed a flat clear coat, then unified the finish with a wash of raw umber artist’s oils and a final flat clear. Off came the window masks, in went the crew: The co-pilot comes from CMK; the seated door gunner comes with the kit. A segment of fine solder wire makes a good bungee cord for the gun. Mike Butry made this display base for the 1/48 scale Tamiya P-51B Mustang built by his father, Bob. o me, using a base to display my models not only showcases the piece, but also adds life and context to a static model. Hereâ&#x20AC;&#x2122;s the easy and inexpensive method Iâ&#x20AC;&#x2122;ve developed for modeling realistic display bases. Although the examples I show feature aircraft, the basic techniques could be used for a wide variety of subject matter. 3 I start by penciling in the section I want to cover with groundwork. When I’m satisfied with the result, I airbrush the edges of the base flat black. Don’t worry if you go over your penciled-in lines; any mistakes can be covered by the groundwork. 5 For the next step I add good old garden-variety dirt to the base. I start by applying a slightly thinned coat of white glue to the base using a flat brush. Here I’m using a ½"-wide brush; if you have a bigger base, use a bigger brush. 2 In addition to the plaque, you’ll need some standard white glue and some static grass, which is available in the model-railroad section of most hobby stores. You’ll also need some paints and brushes from your standard modeling toolbox. 4 Once the paint is dry I use a coarse-grit sanding stick to remove the flatblack paint from the edges of the base. This gives it a rustic, “antiqued” look. 6 I store my dirt in a small plastic container. While the glue is still wet, I gently sprinkle the dirt over the glue-covered area, making sure it’s evenly covered. 7 Let the glue dry overnight, then tip the base to remove any excess dirt. If you’re unhappy with the results, you can repeat the process until you’re satisfied. 9 When the glue’s dry, you can use various earth-tone paints to break up the monochromatic static grass. You can do the same for the dirt-covered sections, too. 8 Once you’re satisfied with the dirt application, you can move on to the static grass. After applying thinned white glue to the areas I want to cover with grass, I use my thumb and forefinger to sprinkle it on. 10 Here’s the finished base, ready to host a 1/48 scale fighter. Next I wanted to build a plank-covered stand, as the Germans used during World War II. Instead of painting the base, I applied a coat of light-brown varnish and let it dry thoroughly. To simulate the planking, I used .060" x .156" styrene strips. To simulate woodgrain, I used coarse-grit sandpaper and pulled it along the length of each strip. I cut the woodgrained strips to various (yet similar) lengths — there was no standard in the field. Working diagonally across the base, I applied the first row of planks. I used the same thinned white glue I used to attach the dirt and grass on the previous base. After completing the first row, I expanded the hardstand left and right, working slowly and fitting the plastic planks together carefully. When the glue was dry and the planks were securely in place, I airbrushed them with a mixture of brown and black. Dry-brushing the planks with various shades of brown broke up the monotony of the finish and helped bring out the woodgrain detail. Using the Henschel VK 30.01 medium tank chassis to propel a powerful 12.8cm antitank gun, the Sturer Emil (Stubborn Emil) production run ended at two. Both vehicles fought on the Eastern Front, where one was destroyed. The other was captured at Stalingrad and is displayed at the Kubinka tank museum. David built Trumpeter’s 1/35 scale kit, replacing the “rubber band” tracks with Trumpeter aftermarket individual links and installing RB Models’ aluminum barrel and brass muzzle brake. He weathered with Vallejo and Secret Weapon pigments and shades of rust from AK Interactive. Jason built Italeri’s 1/72 scale F6F-3 Hellcat from the box and liked it. “It’s an inexpensive, nice kit that looks good painted with Testors and Polly S acrylics,” he says. Christopher set his Academy 1/32 scale F/A-18D on a ¾" plywood base surfaced with 80-grit sandpaper and edged with wood trim. He airbrushed the sandpaper with shades of gray, painted boundary markers, and punched holes to fit tie-downs from Tom’s Modelworks. The aircraft was heavily pre-shaded and weathered with an artist’s-oil pinwash and pastel chalks. Randy Fuller photo. “I love the looks of the L-1011!” says Brad, who built Otaki’s 1/144 scale kit. The fuselage is finished with Tamiya spray cans — Fine White Primer and insignia white (AS-20) — and dressed in Delta livery. He used styrene rod, strip, and sheet to deploy the flaps and slats. A mixed-media kit from International Models Asia (IMA) provides resin, plastic, metal tubing, a lasercut bridge, and all the hull modifications and bridge-deployment gear Andy needed to turn the AFV Club 1/35 scale Churchill Mk.IV AVRE into a bridge layer. Additionally, he scratchbuilt to add: the large ram-cylinder hydraulic lines; a pressurerelief pipe; bolt heads on the slider rails and deployment arm; guides to the bridge supports; tools and stowage; and a floodlamp for the glacis plate. The model’s bridge extends and retracts as the real one did. The vehicle is shown as it would have appeared as the Allies fought through Normandy after D-Day. A veteran model railroader, Chris raised a garage around Esci’s 1/9 scale Harley-Davidson WLA-45. Almost everything besides the bike is scratchbuilt, including: balsa boards scribed and drilled to look more like lumber; formed basswood handles for a paper shovel blade and soldered-brass pitchfork; papers, pictures, posters, manuals, and product labels found on the Internet and printed to scale; sheet-styrene cans; a clay ashtray; a stray headlight and steering wheel from a 1/8 scale Lindberg Model T; a set of wrenches laser-cut from 1⁄64" plywood; and so on. Furthermore, the display is wired for light and sound: The lights are craft pearls hollowed out for grain-of-wheat bulbs; the radio contains a headphone speaker and plays 1950s pop. Using Trumpeter’s 1/35 scale KV-1 Model 1941 as a test bed, Cristian experimented with mixtures of artist’s oils and dirt from his garden to weather and muddy up his tank. “It was fun and educational at the same time,” he says, adding that it was his first Soviet tank. He used a mix of Revell and Vallejo paints along with Vallejo pigments and Winsor & Newton artist’s oils. Davide finished Revell Germany’s 1/48 scale Eurofighter Typhoon with Testors Model Master enamels, Alclad II titanium, and ProModeller (now Flory Models) washes. Bill built Academy’s 1/35 scale M3 Grant and modeled extra stowage for it, including British petrol cans from Ultrcast, a tow cable made from rigging thread, and a stowage box with duffel bags from his spares box. He gave the Grant a desert finish with Tamiya paints: black pre-shading followed by desert yellow (XF-59), flat earth (XF-52), and a lightened shade of field gray (XF-65). Robert added metal grab handles and steps made from copper rod to Gaso.line’s 1/48 scale resin kit of the BTR-70. Karaya cable and cable ends from another kit replaced the kit’s cast version of those parts. He painted the personnel carrier with Tamiya Soviet green and used artist’s oils and colored artist’s pencils for finishing touches. Airfix’s 1/24 scale Ju 87 is a big model that screams for more detail. Dave dove in with a few easy to make additions to improve a classic kit. 1 Take a seat and add details: Dave modeled missing brackets on the pilot’s seat with styrene strip. 4 Dave installed Eduard photoetchedmetal seat belts for the pilot and gunner. 7 Red and yellow buttons and lights help the kit’s instrument panel pop. A lot of the Stuka’s cockpit is on display under the canopy, so Dave used styrene gizmology to dress up the floor. Careful painting and dry-brushing add realism to the pilot and gunner positions. ... and port sides received the same treatment. Dave’s attention to detail is obvious, including the yellow wires with silver clips. 8 In 1/24 scale, the Stuka’s fuselage halves are about 15" long. To ensure a solid fit, Dave glued and clamped the body, then let the glue set for several hours. panel RLM 66, then colored details with fine brushes, 7.
attachment parts I’d cut from the kit firewall. Evergreen styrene strips, brass wire, and solder replicated equipment. Then I painted the firewall RLM 02 grau, 9. The Jumo engine block looks like itâ&#x20AC;&#x2122;s seen a bit of use thanks to Daveâ&#x20AC;&#x2122;s weathering washes and dry-brushing. To build a better radiator, Dave cut away the plastic between the louvers. After gluing black plastic and aluminum screen behind the vanes, Dave is ready to attached the radiator to the engine. Careful painting and the installation of the kit-provided plumbing and wiring make the engine a kit in itself, according to Dave. Dave confirmed that the engine fit the mounting arms, then set it aside for painting. With the inner wings and tail on, the model begins to look like a Stuka. On a crowded workbench, the size of Daveâ&#x20AC;&#x2122;s project is obvious. The detail Airfix supplied for the wing-gun bays seemed anemic to Dave. So, he embellished it with styrene and wire as well as items from his collection of spare parts. the engine-bearing arms to ensure proper alignment, 14. I left the engine off for painting. nents and the weapons, 16. I spruced them up with additional styrene structure and supports, wire plumbing, and compressedair bottles from my spares box, 17. With outer wings on, my big Stuka was ready for painting. Dave printed the black shield from the squadron emblem on clear decal sheet, then applied it over a circle of white decal. Painting done, Dave added the final details, such as the canopy and antenna. Germany’s bent-wing Stuka is an icon of World War II. Dave’s big-scale build is a fitting replica and a tribute to the idea that any kit can be improved with a little more detail. white theater markings under the wings and around the fuselage. Looking to stretch an airplane and your modeling skills? Mike did just that when he took Aurora’s DC-9-10 to a longer -30 using cuts and skin grafts. hen I was a kid, I learned quickly that box art was not a reliable indicator of the model within. I especially remember an Aurora’s DC-9 I picked up that had a beautiful picture of an Air Canada DC-9-30, the stretched version of the famous airliner. In fact, the kit was a reissue of the short DC-9-10. Armed with the modeling skills of a 12-year-old, all I could do at the time was to build it as it came. Recently, I came across one of these vintage kits and thought it might be fun to revisit. But this time, with 40 years of modeling experience behind me, I would make the plastic in the box look like the art on the cover. Instead, I built the new sections with styrene strip and sheet. To lengthen its DC-9, Douglas extended the body forward and aft of the wing. Starting with the left fuselage half, I sawed it apart. I lined the blade up so the cut fell midway between two windows. Using the right half as a splint, I taped the fuselage halves firmly together while I set the correct width for the gap, 1. This ensured that the left fuselage half remained straight during construction of the plug. The forward extension is six windows long. I drew up a template on paper to measure and set the spacing, 2. 1 Working one side at a time means Mike can use the other half to keep the pieces straight around the join. 2 Mike created a template based on the window spacing of the DC-9’s fuselage. Placing it across the gap sets the length of the forward extension to six windows. 3 Four thick strips of styrene bridge the gap. Mike glues and leaves them overnight to ensure a solid bond before proceeding. Additional strips reinforce the join and lay the foundation for the fuselage plug to come. Mike curved heavy sheet styrene around a bottle in an oven to skin the DC-9. Putty and sanding blended the graft. curvature of the body by taping styrene around an empty glass bottle the same diameter as the fuselage and baking it in an oven at 225 degrees Fahrenheit for 15 minutes. The styrene sheet should be the same thickness as the kit’s plastic to be flush with the fuselage. If you can’t find the correct thickness or find working with thick sheet difficult, laminate thin styrene to the required thickness. This completes the left side’s forward plug. windows long — and started the join with strips of styrene, 6. More styrene strips, overlaid as before with sheet styrene, completed the left side. Stretching the right side was a little easier; I started by sawing it apart between windows fore and aft of the wing. (I staggered the cuts on the right to give the fuselage a little extra strength.) Using the extended left half as a splint, I adjusted the pieces for the correct gaps, taped everything together, and glued in plastic strips, 7. Then, as before, I firmed up the joint with more strips and a skin of plastic card. 6 The still-uncut right half keeps everything straight as Mike cuts and stretches the rear fuselage. 7 Mike cut the left and right fuselage parts in different places to give the finished body more strength. 8 Replacing the upper wingtip with the lower tip from the opposite wing minimized filling in conspicuous areas when Mike extended the wings. AN AVID MODELER since the mid-1960s, Mike has finally gotten around to writing his first article for FineScale Modeler. Like so many other modeling-related projects, the article has languished partly finished for many years pending precious spare time amidst family, house, garden, car, and work. Mike has a soft spot for Aurora, since it was the only brand he could get at his neighborhood store when he started. Aurora offered a wide range of subjects that really appealed to kids of the day, including movie and TV subjects, planes, ships, and tanks. Like most kids, Mike built them all. These days, his focus is airliners. Mike’s models can be seen at IPMS Ottawa meetings or online at Yahoogroups Airliner Modelling Digest and Airliner Café. Recently, I was working on a science-fiction scratchbuild with a canopy I had vacuumformed and attached to the fuselage. It was perfectly faired into the fuselage with epoxy putty. Imagine my horror when I saw through that carefully crafted canopy that the pilot was no longer glued to his seat! Not wanting to remove the canopy and redo the fairing, I did this instead: 1. Bored a small hole with my pin vise just slightly larger than a hypodermic needle. The hole allowed me access to the unseen area behind the cockpit’s instrument panel above the pilot figure’s feet. 2. I filled the hypodermic needle syringe with a little white glue. 3. Next, I jostled the pilot back into place by gently rolling and shaking the model. 4. Using the needle and syringe, I injected white glue into the freshly drilled hole. The white glue coated and puddled around the pilot’s feet and remained mostly out of view. 5. Finally, I set the model aside, made sure it was level, and let the glue dry. The white glue dried nearly transparent and all but invisible in that location. Do not use super glue. You risk fogging your canopy when dispensing it in such a confined space. I filled the tiny hole with a dab of putty (although a piece of sprue would have worked, too) and sanded it smooth. – Kenny Haverly Bardstown, Ky.
Use rigid plastic card to protect fragile frets. I came up with a simple way to protect my photoetched-metal frets and save some space, too. After removing the photoetched-metal parts from the original packaging, I insert a piece of stiff plastic (usually recycled from plastic packaging, but any rigid plastic will Would you like to share an idea about a tool or technique? Send a brief description along with a photograph or sketch to “Reader Tips.” E-mail tips@ ﬁnescale.com or visit FineScale.com and click on “Contact Us.” Tips are paid for upon publication; if you live in the U.S., we’ll need your Social Security number to pay you. FSM obtains all publication rights (including electronic rights) to the text and images upon payment. Jim Kline makes his own rubber-tipped tweezers. I cut holes in a block of soft foam to hold a couple of different-size bottles. Spray adhesive on the bottom keeps it stationary on the bench. I keep another foam block on the bench to hold knives. I sprayed adhesive on one side and it sits firmly on the table. When one side of the block gets chewed up and can’t support knives anymore, the block easily pops off so I can spray a different side and put it back. Then I’m back in business! – Richard Davenport Lansing, Mich. I cover the surface of my workbench with PLAS-TEX PolyWall (www.waterproofpanels.com). It comes in sheets of .06" x 48" x 96" for about $25. It’s easy to cut to size with a sharp utility knife or a good pair of scissors. In my experience, it’s impervious to most solvents, including lacquer thinner, acetone, and alcohol, and it’s easy to clean — the only thing I can’t get off is super glue. The remnant makes a great backdrop for model photography. I bought a toothbrush holder at a dollar store; a ½" of cat litter in the bottom works perfectly to hold brushes upright. For yellowing decals,put them under a full spectrum desk lamp until the yellowing goes away. – Timothy Anderson Oroville, Calif. I use a round-handled hobby knife like a rolling pin to flatten small-gauge solder. It makes great seat belts and is very realistic once painted and installed. With practice, you can even thread photoetched-metal buckles with the stuff. – Ryan Harden Gainesville, Fla.
– Mike Walston Sarasota, Fla. I cut and shape my photoetched-metal parts on the sticky side of a Post-it note. I found notepads at Wal-Mart that have the sticky on the whole piece of paper rather than just a band at the top, and they work well, keeping tiny photoetched-metal pieces from flying off the workbench while I’m removing them from the fret. – Jay Jerisek Port Orange, Fla.
You can remove paint overspray from a canopy by gently rubbing the dry paint with the tip of a wooden toothpick. To remove larger areas of paint, make a wooden chisel by cutting a toothpick in half at its widest point and whittling it to shape. The wood is softer than the plastic and won’t scratch it. separated with a hobby knife, fit into tight spaces, and are easy to solder. – Davis Gandees Lutz, Fla. Items that might otherwise end up in the trash can be convenient on your workbench. Wire from old computer parts can be used for a variety of scale modeling tasks, including lighting. Remember the modeling clay we used as kids? Well, I found that it is great for adding weight to tail-heavy aircraft models. It’s flexible enough to mold into the noses of those aircraft and spaces around cockpits. It’s great for 1/48, 1/72, and 1/144 scales by itself, and you can add lead or another metal if needed. Just don’t use too much pressure when pushing the clay into position or you might crack the plastic. I also use clay as a way to hold and/or paint small parts. Take a chunk of clay, knead it for about 10 seconds, flatten it between your palms to get a piece about 2" x 4" and ¼"-½" thick, then press the pad to the top of your workbench. The clay keeps the parts from moving during painting. You can insert toothpicks into the clay to support small parts. Drop paint, glue, or anything else on the clay? Just replace it. I usually use two of these clay pads at a time and get about five or six models out of them before I need to replace them. Clay is inexpensive and available at toy stores and arts and craft stores. – John Zeb East Freetown, Mass. Hide bare model interiors ere’s a quick, easy way to lend the illusion of depth to the windows of armored fighting vehicle models without going to the trouble of scratchbuilding an interior. Paint the window transparent blue-green as usual and glue it in place. Next, curl a piece of metal foil (I used the cap from a yogurt container) around a pen to curve it. Tape the foil to the inside of the hull with the concave side facing the window. From the outside, this gives the model a sense of depth you wouldn’t get by making the window opaque or by blanking it off. Use a shadeless table or desk lamp with a 100-watt incandescent bulb. Hold the tire to the glass base of the bulb (you might want to use pliers here — it gets HOT!) until the tires start to bulge and flatten. The slow progress of the heat is just enough to get the tire to realistically bulge in the sidewall and flatten a bit at the same time. It takes about a minute for a tire (solid or hollow) to start to bulge. Stop when you think it looks natural, and your model will look better than ever. For certain applications, I’ve found duct tape to be a nice detailing media. Depending on your model, it can replicate certain surface textures. There are plenty of colors out there, from the standard gray to multicolor and patterns. You can easily cut duct tape on a piece of glass with a hobby knife, and the reinforcing string embedded in the tape makes a nice grid pattern to use as a rough measurement and cutting guide. It also doesn’t leave as many little fuzzy edges as surgical tape does. I have a habit of walking away from the paint desk without cleaning my palette. To solve this problem, I have started using wax paper as a palette. It is cheap and disposable. A big plus is that a freshly painted piece can be put down without the cutting mat getting paint on it. – Richard Vaughn Henderson, Nev.
– David Perrelli Wallingford, Conn.
guns with ammo belts. The belts are a rubbery material, almost like a rubber band, and need to be painted tan, brass, and copper. What type of coloring media should I use? Enamel and acrylic paints split and Got a modeling problem? Our Questions & Answers column is here to help. E-mail questions@ﬁnescale.com, or visit FineScale.com and click on “Contact Us.” We are not able to conduct lengthy research, such as answering questions on markings and unit histories. We publish letters of general interest in the magazine; however, mail volume and space limitations prevent us from printing every question. Please include your name, town, state, and a daytime phone number. To vary the panzer gray on Tamiya’s 1/48 scale Marder III, Rick Lawler mixed light gray and medium blue with German gray (bottom). A Glad you liked Cookie’s color modulation story. I looked around, and the only set I can find that might be close, at least for the sand colors, is Acrylicos Vallejo’s Desert War Zenith Transformation Set (No. 71.153). Zenith transformation is essentially the same principle as color modulation. You can mix your own colors to do color modulation. After picking the paint you want to use as a base color, mix lighter and darker shades by adding white and black to small amounts of the color. They don’t need to be wildly divergent, just enough to make a difference. Then apply those much as Cookie did: Darker shades lower and underneath, graduating to lighter shades on the sides, and the lightest shades on top. Rick Lawler mixed his own color modulation shades with Tamiya acrylics to paint a 1/48 scale Marder III in the September 2009 FSM. Fraser Gray used a similar approach, again with custom-mixed Tamiya paints, on a 1/35 scale IS-2 in September 2011. Back issues can be ordered by calling Kalmbach customer service, 800-522-6644 (international 262-796-8776) or online at www.FineScale.com/BackIssues. signed for use on hard-to-paint plastics and have been known to adhere to old vinyl track and make it possible to paint them. I know a few modelers who have had luck dipping vinyl parts in Pledge FloorCare Multi-Surface Finish (PFM). After 48 hours, paint seems to stick pretty well. But PFM doesn’t always stick to the vinyl. If nothing else works, I suggest attaching the part, being sure you don’t need to bend it any more. Then you can paint it and, hopefully, the lack of flexing will prevent the paint from coming off. 1 After painting Trumpeter’s USS Cole neutral gray, Aaron masked the top of the waterline. 2 Then he sprayed a coat of oxide red on the lower hull. about “black scale effect” and want to know more. For example, I know that the same subject in three different scales should not be painted with exactly the same shades of color. I can’t remember if large-scale models should be slightly darker or lighter than the true color. – Mike Glasgow Sammamish, Wash. A Scale effect refers to the idea that the intensity of colors appears to diminish the farther away they are. It’s something to do with physics and air and particles and water vapor — but for the purposes of modeling, the smaller the scale, the greater the distance (in effect) that we view it from. So, it will look more realistic if the paint is a tad lighter than the full-size vehicle. Because almost all models are smaller than the subject they represent, and most model paints are matched to their full-size counterparts, scale effect is applicable to any model regardless of scale. To make it work, add white to the colors before painting. As if physics wasn’t bad enough, there’s math involved here, too. Someone came up with a formula to govern how much white to add: Halve the scale of the model and use that number as the percentage of white. For example, if you are painting a 1/48 scale model, mix 24 percent white and 76 percent color. For 1/72 scale, the mix would be 36 percent white; 1/35 scale would 17.5 percent; 1/16 scale, you’d use 8 percent white, and so on. You get the drift. It’s not an exact science, and whether or not to do it is really a matter of personal taste. I think it is a more important consideration for dark colors on small-scale models. Muting blacks, dark grays, and dark greens can prevent them from looking too stark. 3 Aaron aligns strips of tape with the edge of the upper hull mask. 5 All that’s left before airbrushing flat black is to remove the tape guides. 4 The strips guide masking for the lower edge of the boot stripe. 6 Removing all of the masking reveals a straight, even bootstripe. Getting a straight, even waterline Q How do you paint the black waterline on small-scale ships so that it is in scale with the ship? – Larry Maciaszek, Bollingbrook, Ill. This one of two complete Jumo 004 turbojet engines included in the kit. You can leave the fuselage clear to see them or display them on the stands provided. Masks for the canopy and windshield are included in the kit and make painting a snap. on the clear parts must be applied to both interior and exterior surfaces to avoid a translucent effect. I found the wing-panel fit a bit problematic. The upper and lower wing parts didn’t fit over the interior framework smoothly, but a bit of glue and pressure brought things into alignment. Make sure you get the wing locking pins/plates (parts G6 through G19) into their positions smartly; they can affect the wing-root fit of the exterior wing parts. I found the landing gear assemblies were neat and attached well to the frame. They hold the weight of the completed model without a problem. I painted my Horten with Gunze Sangyo Mr. Hobby Color Luftwaffe acrylic paint. period (Panthers and Banshees) and the supersonic era (Tigers, Skyrays, Demons, Crusaders, and Phantom IIs). Kitty Hawk’s single-seater follows its two-seat TF-9J trainer kit, and, not unexpectedly, includes many of the parts common to both versions. However, this kit comes with two complete sprues of parts for the photoreconnaissance F9F-8P as well. It appears that Kitty Hawk at one time planned on issuing the -8P as a separate kit, because one of the clear sprues has all the camera windows and a spare canopy. Another large sprue contains ordnance and pylons. The Sidewinders provided are AIM-9Ls, but late Cougars carried AIM9Bs. Options include early- and late-service Cougars, and folded or spread wings. Subtly recessed panel lines and rivets mark exterior surfaces. The cockpit detail is good, with photoetched-metal instrument panels and consoles, and decals to provide color. Oddly, there is no throttle lever. The photoetched-metal harness appears too skinny and short. Detailed landing gear bays are let down by wheels that seem simplified and a nose strut molded compressed with an undersized scissors. I replaced the oleo section with a longer piece of styrene rod and fashioned a new opened scissors. Get free wallpaper! Want to see Paul’s Cougar on your computer? You can download desktop wallpaper at www.FineScale.com/OnlineExtras. little bit of flash on the parts, but there are significant seams to be removed. Although it’s not mentioned in the instructions, the interior of the hull is scored so waterlining the model will be easy. Assembly begins with the lower hull halves. The only fit issue of the five sections was in Step 6, where a visible gap around the rear of the hull had to be filled. Flipping the hull over starts the interior deck construction; make sure to pay careful attention to drilling stanchion holes in Steps 13 and 14 before mounting the upper deck to the bulkheads. In Step 16, Part I25 needed 1mm shaved off the starboard side to fit snugly. I appreciated the engineering of the movable ramp and bow doors in steps 17-19. This feature provides options for dioramas or display. Overall, the fit of parts is good and should present no problems for the reasonably experienced modeler. I used a mixture of Tamiya, Badger, and Testors Model Master acrylics to recreate the haze green 5-HG, Navy green 5-NG and dull black camouflage scheme of the LSM on the box art. instructions don’t show which type goes where. I used the simple “ring” type (No. PE24) on the upper ends only. The attachment points are actually on the struts and not the wing, so I was able to begin rigging without the upper wing in place. I used medical suture for rigging, looped through the buckles and then back through small sections of stretched plastic cottonswab shafts. After attaching the upper wing to the struts — perfect fit — I tensioned the wires. I used elastic thread from Uschi for the tail control wires, and to rig the center section and landing gear. M4A2 after finding the cannon barrel snapped. All of the vehicles build nicely. Don’t rush Step 64, rigging the stanchions for lifelines. The stanchions are fragile and limber, so I replaced the kit’s thread with stretched sprue, which needed less tension to look right. The kit provides a few extra stanchions in case of breakage. SSW in progress You can see photos and read more about Chuck’s progress as he builds Eduard’s SSW D.III. Simply go to FineScale.com/Reviews. include diagrams showing angles for attaching the beautifully engraved and detailed parts. The seat and cockpit walls are nice, though not highly detailed. Options include a belly tank, posable flaps, control surfaces, and canopy, and two seat inserts, one with molded-in belt detail and one without. Decals are provided for the instrument panel and side consoles. Clear camera windows or optional blanking plates are included, plus closed gear doors for displaying the aircraft in flight. There is no stand in the kit. I had real issues trying to fit the combination nose wheel well/cockpit tub assembly into the fuselage. Finally, I sawed the well and tub apart and installed them separately. But the cockpit still sits too low. The instructions specify 2 grams of nose weight, but there’s little room for it. So, I snipped off the lugs atop the nose-wheel well to make room. I installed additional weight beneath the cockpit as well. Most of the fuselage seam and the forward wing-to-belly joint needed filler. Once I was over the fuselage hurdles, the remaining parts fit nicely and the build went smoothly. The landing gear, wheels, and wheel wells show excellent detail. The gear struts have trunnion mounts at their upper ends, like the real aircraft. Add accurate detailing and perfect decals. Paint and weather like a pro. SUBSCRIBE NOW FOR FREE GIFT! Fill out and mail the attached card. Go to FineScale.com/offer and enter code in the lower right. 800-533-6644 Monday – Friday, 8:30 a.m. – 4:30 p.m. CT. Outside the United States and Canada call 262-796-8776, ext. 661. Please have your credit card ready. Get free wallpaper! Zvezda’s “Stuka zu Fuss” stands ready for an on-screen fire msission. Download wallpaper at www.FineScale.com/OnlineExtras. Posing the hatches open exposes the halftrack’s engine, which looks good straight from the box. he A400M Atlas, Airbus’ military transport, bridges the gap between the C-17 and C-130. Derived from its earlier 1/72 scale release, Revell Germany’s new 1/144 scale Atlas is impressive. But it shares some challenges with its big brother. The exquisitely recessed panel lines and full interior reflect the kit’s high level of detail. The kit offers several options, including posable landing gear and cargo doors plus different propellers. The decals provide three marking options: a French test aircraft and two transports, one each from the German and French air forces. 1/72 MILITARY DIORAMAS, VEHICLES, AFVs & FIGURES. 1/64 RESIN SLOT CAR BODIES, DECALS & STRUCTURES. SCENERY â&#x20AC;˘ MODEL PLANES, CARS & MORE ! COLPARâ&#x20AC;&#x2122;S HobbyTown USA We carry a huge inventory of plastic model kits from around the world! Full Line of Detailing Accessories. Airline models, Decals, Books, Promos, Die Cast Collectibles, Historical & RPG Games & Miniatures, Airbrushes & parts. Large Paint and Tool inventory. Full line R/C department. We ship worldwide. Large selection of kits, supplies and more ! Donâ&#x20AC;&#x2122;t wait any longer! Place your classified ad today! 888-558-1544 x815 Closing Dates: Published 10 times a year. Jan. 2015 issue closes Oct. 14, Feb. closes Nov. 7, Mar. closes Dec. 10, April closes Jan. 7, May closes Feb. 17, July closes April 14, Sep. closes June 15, Oct. closes July 8, Nov. closes Aug. 10, Dec. closes Sept. 9. Wide variety of plastic kits. Old Nascar Kits - please call. Mon - Sat 10-6. Closed Sunday. START – AND FINISH – A MOD EL THIS WEE KEND! WNY’s largest selection of models!!! We specialize in models. New, old, rare and vintage. Tons of detail and weathering products, paint, tools and so much more! Full service hobbies, a full line of HO, N, 3-Rail, military, cars, boats, planes, dollhouses, scratchbuilding supplies, plus details-details-details! Come visit our new store! Plastic modeling kits. Paint, tools, scenery, & accessories. Scale model railroads & rockets. Mon-Sat 10:00am-6:00pm. Closed Sunday. We believe that our readers are as important as our advertisers. If you do not receive your merchandise or a reply from an advertiser within a reasonable period, please contact us. Provide details about what you ordered and the amount you paid. If no action is obtained after we forward your complaint to the advertiser, we will not accept further advertising from them. FineScale Modeler magazine, 21027 Crossroads Circle, Waukesha, WI 53187 The Advertiser Index is provided as a service to FineScale Modeler magazine readers. The magazine is not responsible for omissions or for typographical errors in names or page numbers. We carry the best from A-Model to Zotz and 43,000 items in between! Find it with our easy-to-use search engine. www.FineScale.com Tell us what you think: Register to join our forum. It’s free! Coast (now Ghana) where the aircraft was turned over to the Royal Air Force. As I recall, he got to fly in a “clipper” back to the U.S., but I don’t know which type of aircraft it may have been. Thirty years later, I was also a sergeant in the U.S. Air Force, serving a tour as a still photographer (smile, you’re on Combat Camera) in Vietnam and stationed at Tan Son Nhut (a South Vietnamese airbase near Saigon). I documented every aspect of Air Force service, including flying backseat on forward air control missions in the North American OV-10A Bronco.